It’s a bird! It’s a plane! No… it’s Balthazar the Pink! Walking to the coffee shop, phone in hand, I was in a hurry. I had an appointment with a real, live superhero. No, Wonder Woman and I didn’t have a date with a croissant. 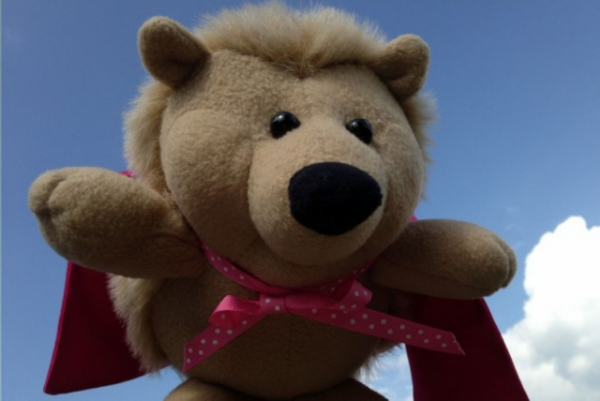 I was meeting children’s book hero Balthazar the Pink, a little hedgehog with a big heart and a pink cape. Balthazar, his family, and his creator, author Katie Newcomb, were generous enough to meet with me to talk about her book Balthazar the Pink, parenting and of course, pink! Katie, mom to Dillon and Wyatt, talked about her journey with her sons and the role pink plays in their everyday lives. At two and a half years old, Wyatt decided upon a favorite color – pink. Katie took his choice in stride, combing the toy aisles for pink options. Much to her frustration, pink toys were almost exclusively marketed to girls. “Do you how hard it is to find a pink car or train?” she asked. “Kids are so inquisitive. I want the world to still be that big frontier for them to explore, and that’s why I got really mad at the whole notion of pink being for girls. It seemed like such an easy thing. And then to have it be restricted, and so early! Katie’s search for non-gendered pink toys was a challenge. But rather than accepting defeat, she saw an opportunity. She could contribute; create something new for children like her son. She set to work drawing inspiration from her world. Wyatt consistently requested the pink plate at dinner or a pink sucker at the bank. She supplemented these anecdotes with research about the history of gendered colors, especially for babies and children. Katie was surprised to learn that in the early 20th century American families were told to choose blue, a “delicate” color, for girls, while pink, “being a more decided and stronger color,” was for boys only. Balthazar, his brother Fletcher, his sister Agnes, and their parents enjoy the various pleasures of pink throughout the book. From his pink plush monkey to pink flowers for his mom, it’s impossible not to relish the joy pink gives Balthazar and his family. Mom, Dad & Balthazar, wearing his pink cape. Katie wanted to bring the story of Balthazar to life, so she sought out former Marquette University classmate Erin Slattery-Black, a professional costume designer, technician, and creator of Lyla Tov Monsters. Erin embraced the story and created five beautiful plush hedgehogs of varying size, “fur” color and texture, complete with clothing and accessories. Impeccably crafted, the hedgehogs are soft yet sturdy, gently huggable, and can be posed. The pages of Balthazar the Pink are filled with photos of the furry plush family enjoying one another and everything pink. Katie chose to take all the photos for the book with her phone, creating a more intimate feel that modern families can relate to. Author Katie Newcomb with Balthazar & his family. For Katie, it comes down to empowerment. “It’s about the development of their personalities and souls. Limiting [children] is going to be a detriment to all of us,” she said. “If they aren’t free to explore who they are and what they like – if they don’t feel safe to do that – then what kind of message are we sending to them?” I couldn’t agree more. IF YOU LIKED THIS POST YOU’LL PROBABLY ALSO LIKE THESE. When pink lands on the Red Planet. Pink is for pishers and blue is for schmoozers. Gender words are an anamoly to me. We have got not to give too much credence to words, especially words which put us in a box. That being said, I’m searching for that perfect blintze-sour cream for boys and applesauce for girls?